be sure to see what’s available in our online catalogue! 3D printing allows you to create a physical object from a three-dimensional digital model. Come and learn how to use this fantastic technology here at the library! Not only do we have three 3D printers, but we also have a 3Doodler pen, which allows you to “draw” in 3D! You no longer need to complete an Introduction Session, you can start 3D Printing right away! 3D printing does not cost a lot – you can purchase your 3D print for only $0.10 per gram, plus a base fee of $2! What can you make on the 3D printer? Almost anything: missing Lego pieces, game tokens, knobs and dials, business card holders, soap dishes, cookie cutters, and so much more! Looking to make unique decorations? Need to make an open hours sign for your small busniess? Want to make a custom bumper sticker? 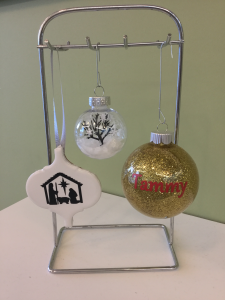 Interested in crafting with vinyl, but don’t know how? We can help! If you buy our vinyl for your projects, it will cost $0.03 per square inch plus a base fee of $2. If you bring in your own vinyl from home – you only need to pay the base fee of $2! Check out our upcoming vinyl cutter programs in our online catalogue! 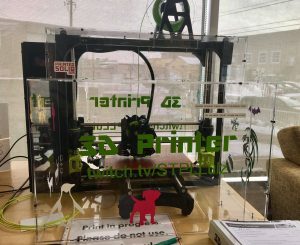 St. Thomas Public Library offers “maker kits” that you can borrow and take home, or use within the library. Suitable for all ages, our kits will inspire you to get your creative juices flowing! Try out the 3D Doodler pen to freestyle a sculpture or enhance an existing 3D print. Or why not take home a Makey Makey kit and turn everyday objects into touchpads, like creating a piano from bananas! 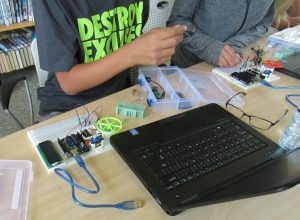 Arduino is the next level up for coding, and with these kits, you can dabble with small circuit boards; micro-controllers that let you hook up sensors to interact with the physical world around you. Arduino kits come in a children’s version also, where the coding is done in simple “block-style” graphics, to allow for the easiest introduction to coding!